Even the Lesbians think he's Hot! She can't even make a good Aloo Ghobi! Mama, why would you die for me? A while ago I wrote about Opening Pandora's box - reconnecting with someone from the past, and whether or not that would be a good idea. In the end we did reconnect through email and Facebook. So far it has worked out okay... we've caught up on each others lives and seen some recent photos. And that was enough for me. But the internet (especially Facebook) has a way of letting the past find you. For example, I give you Exhibit A: Can you guess which one is me? There are 2 rows of girls, and if we number them from left to right, tell me who you think I am. I have just reconnected with 8-9 people from that picture on Facebook. 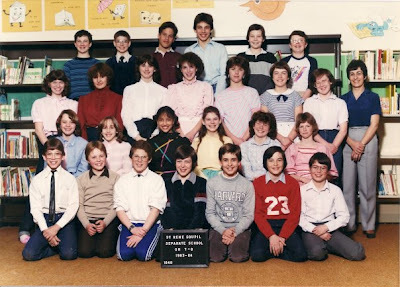 This was a grade school picture, a split class of grade 7-8. The emails are flying around as everyone gets caught up and suddenly there are plans for a reunion, or at least a get together this summer. Some still live in the city we grew up in, some are close and others, like me, have moved far away but still make it back to visit family every year. So it seems that the past is coming back... as long as the fashions and hair styles don't! Check out his bio in Redbook's Hottest Husband of 2009. Even better... Go VOTE for him. And check out this great video that Firemom did up (showing how cute he was even as a baby!) or read her blog tribute to Firedad on Stop, Drop and Blog. or the party that almost wasn't! The 5 couples consisted of us, our friends Sandy and Jason, Sandy's sister Colleen and her husband Jason, and Sandy's brother Jerome and his fiance Colleen (yes, they keep marying people with all the same names, it's very confusing) and one other couple. We got the call from Colleen (no clue which one) at 9:30 Sunday morning to let us know that Sandy was in labour! We knew this was a possbility since her due date was Feb 26. We all assumed that first babies never come early, so she could come to the Oscar's, eat lots of spicy Indian food and get things moving. Being a close knit family all 6 of them were planning on being at the hospital till the baby was born, and so none of them would be coming to the party. Alrighty then. We changed our mindset to a nice quiet evening of 4 (Sandy's family's from Newfoundland so evenings with them are anything but quiet). We went ahead with the food prep, since most of it was done and we had already rented the chaffing dishes. Just being 4 people was no reason we should have cold curry. The house was cleaned, the table laid out, the ballots printed. and we waited. and waited. and waited. Just as I was about to call to make sure everything was okay, they arrived! Phew, crisis averted! We had a great time. I loved the new format of the show, and Hugh Jackman was an excellent host. I especially liked that it didn't run late. We live in the AST time zone (this one doesn't even exist in the U.S., we are that much further East) so the show didn't finish until 12:55 AM here. Very much past my bedtime. Hilary was the winner once again, with 12 correct guesses. I came in second with 11, I think an all time high for me. Oh, and baby Catherine Theresa (thank goodness they didn't name her Colleen, though I fully plan on calling her Oscar myself) made her entrance via C-section around 6:00 PM yesterday. Mom, Dad and all the Aunts and Uncles are doing well. This is one of the final dishes being prepared for tomorrow's festivities. We have this one frequently. Sometimes Hilary makes it with peas and sometimes with soya beans. Either way, it's very good. There is now less then 1 day left till the start of the 81st Annual Academy Awars. And what am I doing? Not cleaning, not rearranging furniture, not helping with the cooking. Nope, I'm working on my ballot! Our party isn't just about good foods and fabulous friends. It's about being able to hold your head up high all year long as the winner of the "Bragging Rights" Being the one from our group who predicted (or guessed!) the most winners. There will be a flurry of last minute activity once every one arrives and the ballots are handed out. Some keep theirs very secret till the last minute, others are begging advice from anyone who will listen to them. Then we collect the sheets and hand them out for marking. We often miss a lot of the speaches as the shouts criss-cross the room~ "Who did I put down for this one?" "How many do I have right so far?" "I can't find this category on the sheet!!!" So here are my early predictions (subject to change as I troll the internet for more insight tonight. Today is the 100th day of school for Liam's class. 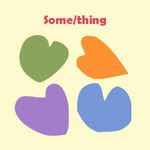 Everyone had to find 100 things, count them and bring them into the class to show how big or how little 100 things can be. It will be interesting to see what everyone else brought in. After my last Oscar update commenters asked if Liam liked all this food that Hilary is making. Liam is easily one of the pickiest, finickiest kids I have ever met. He would survive on fruit if allowed. He does eat bread products (bread, toast, bagels, cereal) but it's not something he would pick first off. He will eat raw carrots and occasionally green beans. He was 5.5 before he would even consider eating a French Fry and still rarely has them. Lately we have seen him eat more chicken (homemade nuggets) and he did actually have a piece (bite sized, not serving size) of turkey at Christmas. I can probably count the number of hamburgers he has eaten in his life. Transportation Style noodles continue to be a regularly served item. Hilary and I used to question how we got to this point. Where did we go wrong? Now however, we have accepted that Liam is not an adventurous eater and that food does not hold a whole lot of appeal to him. From the very first serving of mushed up carrots, he has expressed his dislike of food. Hilary was a stay at home mom who is also a foodie. 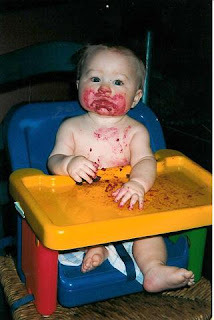 She made all of his baby food, exposed him to all sorts of textures and tastes. Yet most nights the only way to even get him to try the food would have been for me to get him in a full nelson with one arm, pry his mouth open with my other arm while Hilary shoveled the food in and ducked before he spit it back out. Needless to say we never actually tried this approach. We eventually figured out that he liked Minigos and if you put the real food on the spoon first and then dipped the whole thing in the Minigo, you might be able to sneak it past him. Only if he wasn't paying attention. Liam trying to injest his food through his skin so he wouldn't have to eat it. We still offer him new foods and we don't cater to him by cooking him a seperate meal every day. 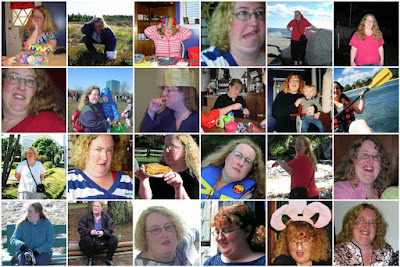 I have lot of food "issues" (I like to call them likes and dislikes, others call them "issues") and I would not want someone to be constently forcing me to eat foods that I don't like. Hilary once offered me a spoonful of something that I didn't like. I thought it was something else and she thought I knew that it was the yucky food (I've blocked out what it was, even though it was only last year). The moment it hit my mouth I spit it out and burst into tears. I cannot and will not inflict that on Liam every day. If he doesn't want to eat something, then who am I to force him? I do believe that as time goes on his palate will mature and he will become more adventurous. And if he doesn't, then more yummy stuff for the rest of us! Yesterday Hilary tried her hand at making Paneer. This was a practice dish for our diner tonight. Needless to say I think we will be having a lot of Paneer Dabari in our future. I was out while she was making it so, there aren't any pictures. I'll take some when she makes the batch for the party. Today she made the Saag portion of the Saag Aloo. Saag means a spinach based curry and Aloo means potatoes. Hilary will cook and add the potatoes on Sunday, as they don't freeze and keep. It may look like green newborn baby poop in a frying pan, but don't let looks fool you. This is one tasty dish. This post is the last in a series this week helping to bring awareness to Freedom to Marry Week. Check out The Other Mother for other bloggers participating in their blog carnival celebrating love. Hilary and I have been together now for just over 15 years. Like most lesbians, we started living together within the first few days of being together. The plan was that I was only going to live there till I got a place of my own... yeah right! In 15 years we have survived being unemployed, starting a career, moving across the country to a place we had never been before, buying our first house and then our second, adopting a son together, the deaths of family members, changes in careers and too many hair styles and colours to count. Through it all she has been my best friend, my strength and my love. We don't really celebrate Valentine's day because we don't need one day to celebrate our love, we do it every day. This post is the fourth in a series this week helping to bring awareness to Freedom to Marry Week. Check out The Other Mother for other bloggers participating in their blog carnival celebrating love. So I kinda, sorta cheated for something Blue. 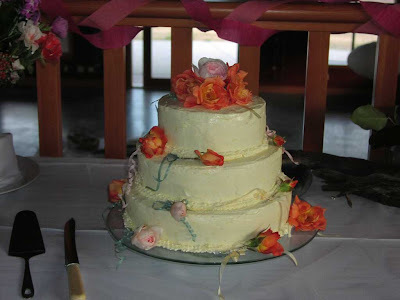 This is a wedding cake that we made for friends a few years ago. 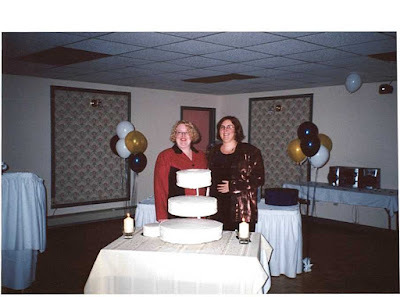 The actual cake had white and yellow flowers, but I tinted the picture since I couldn't find anything blue for this post! This post is the third in a series this week helping to bring awareness to Freedom to Marry Week. Check out The Other Mother for other bloggers participating in their blog carnival celebrating love. 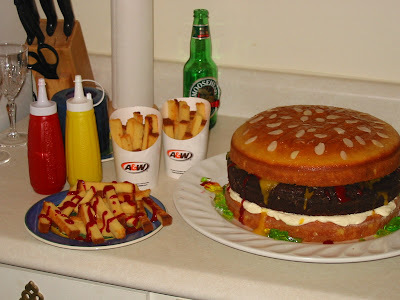 This cake idea we BORROWED from Bob Blumer on the Surreal Gourmet. The bun is 2 layers of white cake, the patti is a brownie, the mustard is mango coulis, the ketchup is raspberry coulis, the relish is green Jello and the mayonaise (we're Canadian, we put Mayo on burgers) is white butter cream icing. And don't forget the fries! Toasted pound cake. It was very yummy! This post is the second in a series this week helping to bring awareness to Freedom to Marry Week. Check out The Other Mother for other bloggers participating in their blog carnival celebrating love. This wedding cake was made by Hilary and her Mum to welcome a NEW member to our family. This post is the first in a series this week helping to bring awareness to Freedom to Marry Week. Check out The Other Mother for other bloggers participating in their blog carnival celebrating love. An OLD picture of Hilary and I, circa 2001. This wasn't our wedding, we did however make the moster cake! 4 dozen egg whites went into the bottom layer alone. It fed the 150 people at the wedding as dessert and the bride and groom still took home full layers. The cake was white with raspberry cream icing between the layers and covered in vanilla butter cream icing. The potatoes are cooked then tossed with onion, peas, carrots, ginger, garlic, coriander, cumin, amchoor powder (dried mango) and some cayen pepper. Pastry is not our forte so we tried an unusual approach: Pillsbury pie crust. Hilary cut it into chunks, rolled each chunk into a circle and then cut it in half. We fried them till they were golden brown. They were some of the best samosa's I've ever had! Much better then the ones from the Pizza shop down the street (don't ask, they seem to have quite a mishmash of cultures going on). Hilary is planning Saag Aloo, Chicken Makhani (butter chicken) and Paneer Darbari for next weekend. We've started on Oscar Prep. February is a busy month for us, with lots of cooking as we try to make as much as we can ahead of time and freeze it. Here is a sampling of what we did this weekend. I'm sorry that we don't have Smell-O-Vision for you, because the aroma's in our house right now are amaing! Toasting spices to make Garum Masala. I have a couple of others to come later. This will be quite the feast when we are done! Even though Hilary and I haven't excericed our right to marry, we are still all for it! Next week is Freedom to Marry Week for our southern neighbours. There are lots of ways that you can get involved and help spread the word. One way is to join The Other Mother and other bloggers in their blog carnival celebrating love. You can post a photo, a memory, a poem, some music, or a combination. I have pretty eclectic tastes when it comes to books. I read fiction and non-fiction, kid's lit, historical romances, autobiographies and pretty much anything in between. I'm especially a big fan of murder mysteries. This is one book that I won't be adding to my shelves though. I don't expect mass media outlets to really get the topic of adoption. I know that sensationalism sells. But this one seems to be going a bit too far. As Angelina’s safety hangs in the balance, Jack and Melissa will stop at nothing to protect their child. A horrifying game of intimidation and double crosses begins that quickly becomes a death spiral where absolutely no one is safe. Just what adoption needs; another story of first parents being the dredges of the earth who want to take their baby back. It's that time of year again. The time when Hilary breaks out the cookbooks, trolls the Internet, checks her back copies of Gourmet magazine and decides on the theme for the our upcoming Oscar party! This will be our 11Th year hosting an Oscar party in Halifax. Lately our food has been theme based. Last year was the "International Year of the Potato". We've had "Things you can poke with a stick", "It's a Wrap" and "International year "(which had foods from countries that were featured in the movies that year). Most years have feature some sort of Meat on a Stick (Satays, kebabs, meatcycles) and twiced baked potatoes. This years theme, as you can see, is Indian food. Our friends are not very adventurous when it comes to spicy food, so Hilary will be toning things down accordingly. As part of the preparation we of course have to sample! Always my favorite part (except the time we made the monster wedding cake.... I did not want to sample icing or Irish Chocolate Potato cake ever again!). So yesterday we called in a babysitter and headed out to a local market/gourmet shop to peruse their Indian fare. Halifax is not exactly the mecca of international cuisine. We have 2 Indian food stores, otherwise we are left with whatever can be found in our local supermarkets. We both like Paneer Darbari the best, "Soft cubes of cottage cheese simmered in a rich tomato sauce" (the middle one). The other 2 were nice, but we didn't like the texture of the peas. The third one is very similar to butter chicken, which is already on the menu for Oscar night. So Hilary is now researching Paneer Darbari recipes and even plans to make her own Paneer! I'll try to post recipes and pictures as we go. And who can tell me where the title for this post comes from? Six more weeks of winter after Shubenacadie Sam sees shadow in N.S. Damn that rodent and his shadow!! Oh this boy is making me grey!! So we are walking to gymnastics on Saturday, holding hands as we go through the parking lot. I ask him to switch to my right hand so that he's on the outside, not near the cars. Of course, he asks me why. Silly me told him the truth..... I wanted him away from the cars so that if one slid on the ice he wouldn't get hit by it. He of course figured out pretty quickly that this was only because the car would hit me instead. Instead of accepting this as an unselfish act of love on my part, he F.R.E.A.K.S. O.U.T. Sobbing about my impeding death. Hysterics about what would happen to him if I were to die right there in the parking lot, leaving him alone. Sadness at having to grieve for me. I finally calm him down and convince him that I am not going to die right there in his arms any second now. And like most 6 year olds, he's off onto a completely different topic within minutes. Our day continued along quite nicely. We had lunch, did some shopping, went home to play and go tobogganing. Standard Saturday stuff. Things were going along all tickety-boo till we were having a cuddle in his bed. I could tell from the way his face was scrunching up that he was upset and trying not to cry. So I asked the fateful question "What's wrong honey?" Ummm... cause that's what Mama's do? Somehow that didn't seem like a very reassuring answer while we cuddled under his glow in the dark stars. The whole concept of being willing to die for someone else seemed way too much for him to grasp. And honestly? It was way too much for me to try and explain. Ah the joys of navigating these parenting waters. Where did I leave my handbook again?